Motorbase Performance duo Mat Jackson and Andrew Jordan shared the spoils at the UK’s fastest racing circuit, with a win apiece extending the Kent-based squad’s Independent Teams’ Championship lead. Pace was strong for the two Ford Focuses in Free Practice at Thruxton, though eighth and fourteenth in qualifying for Jordan and Jackson respectively left both feeling somewhat deflated. Jordan immediately made his intentions clear in Sunday’s opening race, charging off the line to take MG’s Ashley Sutton and Josh Cook into turn one. Frenetic racing ensued as the laps went by with battles up and down the field throughout a tightly-bunched pack. The Pirtek Racing man traded paint and positions on his way into the top ten. Meanwhile, Jackson was forced into the pits with a puncture and damage to the front left quarter of his Duo-backed Focus. He would only muster 21st as a result. The racing wasn’t done for the other side of the Motorbase garage though, as Jordan was able to take full advantage of the race-ending melee on the exit of Club on lap 11 – picking his way through into third in the #77 Ford and netting his first podium with the Motorbase outfit. Race two started equally well for the Midlander – shooting off the line and into second past the Speedworks Toyota of Tom Ingram. His attentions were then onto hunting down Adam Morgan, leading out-front in the WIX Racing Mercedes. Race management has always been key at Thruxton, given the high-speed nature of the circuit and the abrasiveness of the track’s surface. With 56kg of ballast on-board, Jordan was content to bide his time and play the long-game – keeping pressure on Morgan while doing his utmost to preserve his tyres . The move for the lead came on lap 11. Jordan was right with Morgan into Club following a good run through Church. Out of the final chicane, the Focus was able to out-drag the A Class over the start/finish and into the lead come Allard. With just a lap to go, Jordan had enough despite a gaggle of cars in close company waiting to pounce. It was his first victory since Croft 2014 – long overdue for the 2013 champion. “It felt great to be back on the top step,” said Jordan. “I knew that when the time was right we’d get the win. “We rolled out on the pace in Free Practice and although we didn’t get the qualifying result we wanted we knew we had the race pace so to be able to back that up with a podium and race win was brilliant. A recovery drive from Jackson in the sister car saw him make up twelve positions to place an eventual eighth in race two. The reverse grid draw for race three resulted in a front-row start for Jackson, P2, with Jordan dropping to ninth with maximum ballast on-board. Right out of the blocks, Jackson was past the pole-sitting Proton of Dan Welch and into the lead, where he would stay – controlling the race from lights to flag. In the process of taking Motorbase’s second race win on the day, he became one of only two drivers to notch two victories in the 2016 campaign – the other being WIX Racing’s Morgan. A reverse of fortunes saw Jordan end on a low as he picked up a puncture on lap seven, eventually crossing the line in 21st position. 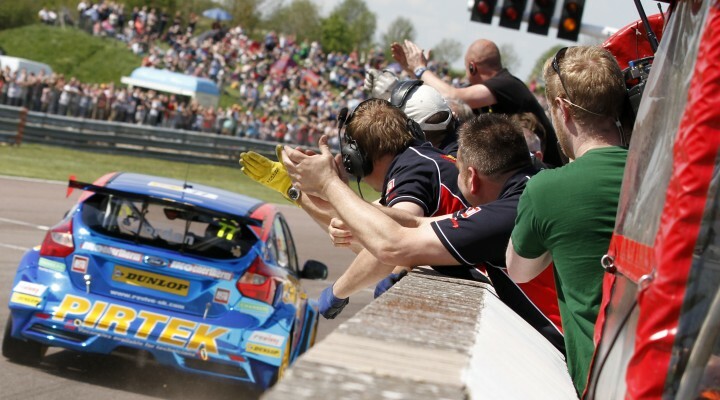 Motorbase Performance leaves Thruxton in a strengthened Championship position having extended its lead in the Independent Teams’ standings and closed the gap on the HiQ Teams’ standings, while Jordan moves into second in the Independent Drivers’ Championship with Jackson close behind in third – fourth in the Overall Drivers’ Standings. The Dunlop MSA British Touring Car Championship returns in four weeks’ time for rounds 10, 11 and 12 at Oulton Park, Cheshire on June 4/5.